When it comes to the opening round of this year’s NHL Draft, things pretty much played out exactly as we had been discussing over the past few weeks. You had LA GM Rob Blake desperate to add a top-6 forward to his roster, yet lacking an appetite to trade pick No. 20 to solve that issue. 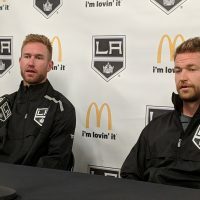 This left the Kings focused on a small handful of prospects – around five players to start the day, per Mark Yannetti, Director of Amateur Scouting – to focus in on as other team’s selected ahead of them. Similar to what Yannetti had indicated to us earlier in the week during a media conference call, it was nearly impossible to move up. The Kings were itching to move up one source inside the team told us. However, they just couldn’t find the right partner. 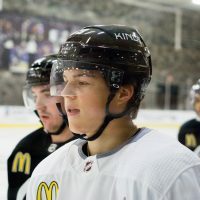 Prior to the draft, we had indicated there was some interest in Joel Farabee (not just by the Kings, but several NHL teams). And then he was gone. In recent weeks, I talked to several NHL scouts who know, and they all agreed – once you get by the Top 10, Farabee was THE guy. He "checks all the boxes" of teams looking for a skilled top-6 winger. My favorite text that just came in from NHL scout – "There was no way Farabee was getting by Philly." At that point, things started to get serious. There had been a few surprises (as there are every Draft day) and you really had to start to wonder which direction Blake and Yannetti were going to execute on. People talking about forward Serron Noel. All but guarantee, that's not who LA Kings are taking in RD1. There was a brief moment, right before the Kings selected, where we were getting some intel that they may trade down a few picks. Ultimately, that didn’t play out and the pick came in. 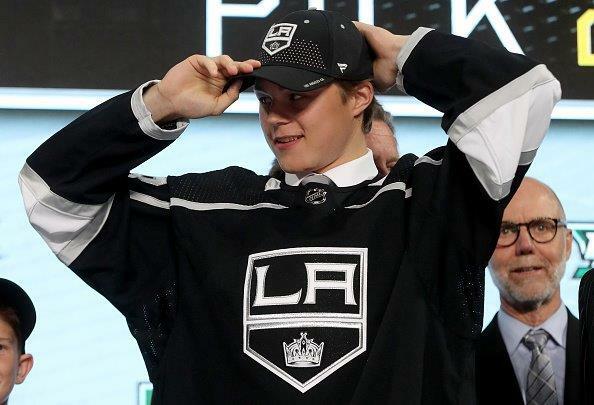 With the 20th selection in the 2018 NHL Draft, Los Angeles selected forward Rasmus Kupari of Finland. 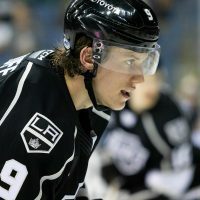 Speed based player, top end skater that has Kempe-type speed, very good release and touch. Played against men this past season. Kings takes slick Finnish center Rasmus Kupari. Dual shot/pass threat with size and excellent skating/agility. So-so 2nd half killed his stock. Looked like top-10 pick before WJC. Standing 6-foot-1 at 188 pounds, Kupari is very young, having just turned 18 in March. He shoots right, can play center or wing, and will play next season in Finland before coming to North America for the 2019-20 season (most likely in the AHL). Kupari will attend Kings Development Camp this week. When speaking with him by phone after being selected, he commented that he had never been to Los Angeles before, but was looking forward to the trip. 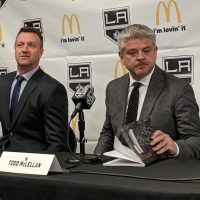 He dropped Anze Kopitar’s name when answering questions about what he knew about the organization prior to being drafted. He also added that Teemu Selanne was one of his favorite players growing up (naturally!). Additionally, he remembered meeting Mike Futa at the recent NHL Combine, but could not offer up anything too memorable that stood about their interview. Futa later shared with us that Kupari has a skating style similar to Adrian Kempe and the ultimate decision to select Kupari came down to him and one other player. He said that Philadelphia didn’t select either of the two players at No. 19, giving he Kings to ultimately take the player they wanted most with the pick. Ruttu – He was higher on our list earlier in the year, and then he was down a little, then back up. It's tough when you play in a pro league and don't get PP time. The defensive part of the game became better as the season went on. With just a handful of picks remaining in the first round, we asked Futa if there was any chance they’d somehow find a way to add another pick before No. 31, and he didn’t see that as very likely.